Diesel Versus Electric Power – The abundant list of options for each product on the market testifies that manufacturers are attempting to cater to customer demands. The manner in which equipment is driven is no different, with customers calling for various power-source configurations. Greenrock has provided Electric Trommel Screens to various customers. So, which power-source should you choose? There are pros and cons to both diesel/hydraulic and electric configurations. The greatest benefit of the diesel/hydraulic power-source is that it is self-contained with only fuel required. This allows the unit to be located in remote locations where an electric power-source is unavailable. Another noted benefit is that there are no cumbersome electric cables to handle. Having each plant equipped with diesel/hydraulic power-units provides added flexibility. Operators can simply and quickly split their system. If a particular plant is not required, engines can be simply turned off. An example of this would be if additional further crushing or screening is not required to produce a product, then units not utilized in this process can be shut off, reducing operators costs. This can help offset fuel and maintenance costs of the operation. Self-contained power-units generally are made up with a diesel engine coupled with hydraulic pumps, control valves to operate the system and hydraulic motors. This simple circuit eliminates the need for expensive control panels, starters, wiring cables, and connectors. This circuit allows for easier serviceability in that the diesel mechanic that services your loader on site may be able to service your track conveyor or trommel. Electric systems generally are much more complicated and may require a trained service engineer. The advantages of electric-powered equipment over diesel models extend well beyond the obvious savings on diesel fuel. Electric-powered equipment can significantly reduce operating and maintenance costs while providing unbeatable dependability and uptime. Electric systems are much more efficient than their hydraulic equivalents and more reliable regardless of the climate they are operating in. Diesel/hydraulic power-units tend to be more temperamental in extreme climates such as high altitudes. Edge Innovate recently commissioned two 65ft track conveyors high in the Austrian Alps. Due to the location in which they were to be employed, the units were fitted with electric motors and a diesel/hydraulic power unit. The diesel power unit was utilized to move the conveyor into position and for conveyor angle adjustment. Once in position, the operator ran the conveyor belt via its electric motors. Another factor to be considered in the Diesel Versus Electric Power debate is emission regulations. Trying to keep up with new engine tier regulations can be difficult, there is no such issue with electric power-units. With plants that require multiple power-units, electric systems are much easier to gain permits for than their diesel/hydraulic counterparts in many parts of the world. Due to their emission-free operation, electric powered units can be operated indoors or moved between indoor and outdoor applications. With diesel prices constantly fluctuating, electric powered units allow for much more accurate forecasting and also removes the need to store or handle diesel fuel on site. Besides savings on diesel fuel, electric powered equipment (like an electric trommel screen) eliminates the costs and downtime associated with maintaining a diesel engine and radiator. Although an electric system may require trained service engineers to carry out maintenance, the regularity of service is much less than that of a diesel engine and will incur less downtime due to a blocked filter, oil and coolant exchange, air filter replacement, busted hose or a dusty environment. Recently, however; more manufacturers are returning to electric options but with the convenience of a self-contained power unit. The Edge Onboard Genset Option is an example of this thinking. The Diesel Genset brings to the user a unique trio of highly efficient running solutions. The diesel/electric generator allows the conveyor belt on the machine to be driven by a Direct Electric Drive. This feature can be up to 40% more efficient than a traditional Diesel / Hydraulic system or indeed other types of Dual Power systems consisting of an Electric / Hydraulic combination. The Edge Genset option also allows it to be connected to the Mains Electric. This easily allows the operator to turn off the Genset and switch over to Mains Electric where available. This is the ultimate in running cost efficiency. Additionally, this option allows an Edge unit to be easily set to be powered by another Diesel/Electric Machine close by. This has obvious running and maintenance cost advantages. Although there is a cost differential for this option, it provides end users with all of the benefits of a self-contained diesel/hydraulic power unit and the advantages of an electric system. So the question still to be answered; which power-source configuration is the best choice in Diesel Versus Electric Power? The simplicity of the diesel/hydraulic system cannot be overlooked alongside its superior flexibility to work in remote locations. There are a number of applications that a diesel/hydraulic power unit would be recommended over an electric counterpart such as; units for rental from a month to month basis, units that needed to be moved regularly and that must be broken down in numerous sub-assemblies in order to transport and if the unit is to be located miles from the nearest electric power-source. Luckily EDGE Innovate is one such company that can cater to all facets of the industry. 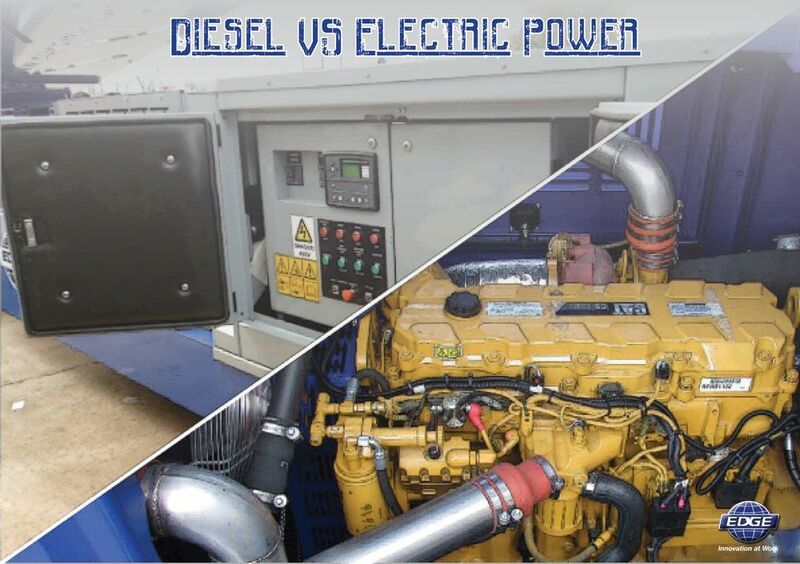 Power-source options (Diesel Versus Electric Power) offered on the Edge Innovate product range include; Diesel/Hydraulic, Electric, Dual Power and Electric Genset. Although there are various options available, it is vitally important to select the correct power configuration to suit your needs and environmental surroundings in which the product is to be employed.